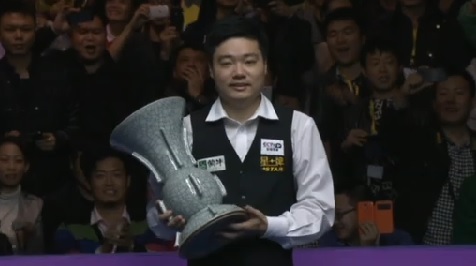 Congratulations to China’s Ding Junhui, who has today defeated Marco Fu 10-9 in a thrilling final to win the 2013 International Championship and claim the top prize of £125,000, together with 8,000 ranking points. 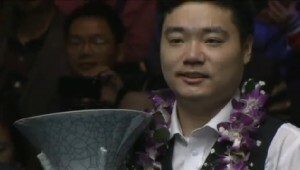 Ding becomes the first player to win three consecutive ranking event titles in the same season, since Stephen Hendry back in 1990, while he also moves up to a career-high ranking of number three after the tournament. It was far from straight-forward, but Ding Junhui today survived a strong performance from Hong Kong’s Marco Fu, to take the last two frames in brilliant style and capture the 2013 International Championship. The inevitable late match tension followed an exceptional opening part of the match, which saw Marco take a 3-1 lead at the first mid-session interval, before Ding hit back with breaks of 108, 92, 138, 127 and 126 on his way to a 6-4 lead. Marco though was not to be overawed, taking the next three, adding his second ton of the match to move back in front at 7-6, as the players headed into their final mid-session interval. From there, the two continued to trade frames, Ding taking the 18th to force what had seemed for some time like an inevitable decider, before he eventually came through to take his ninth career ranking title. Having already won the Shanghai Masters and Indian Open tournaments recently in fine style this season, there is little else that we can say about a player who is now clearly becoming the all-round force that we had first suspected that he would become, when he won his first three ranking titles as a teenager. In winning today, he has drawn level with John Parrott and Peter Ebdon with nine ranking titles, just one behind Jimmy White on ten. It has not all been straight-forward for him since then, the infamous defeat to Ronnie O’Sullivan at the Masters calling into question his temperament, but he has now very much demonstrated that he has overcome any such problems. 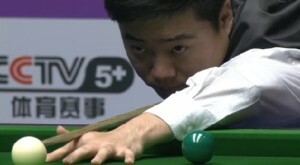 Having won the UK Championship, Masters and International Championship events, all attention must now surely be on the Crucible, and whether he can become the first Chinese player to win the World Championship title in Sheffield. There is no reason for me why he cannot, but having only once before made it to the semi-final set-up there, it will be interesting to see whether he can better that over the next few seasons. Time will tell. Credit also to runner-up Marco Fu, who pushed arguably the best player in the world right now all the way in what is his third ranking event final of 2013, which earns him a career-high ranking of number six after this tournament. Marco has not always been the world’s most consistent player, but over the past 18 months has enjoyed as much success as he ever has on the professional circuit. With few points to defend during the remainder of this season, he could rise further still over the coming months. As well as a classic final, the event also saw two high-quality semi-finals, with Joe Perry narrowly losing out to Marco Fu in a deciding frame on Friday, while a typically determined Graeme Dott pushed Ding hard yesterday before losing out 9-7. Whilst both will have been disappointed to have lost, they have at least provided their hopes of earning a place in the 2014 Masters a timely boost, Perry in particular moving up into the last qualifying place at the expense of Ali Carter, with three events still to go before the crucial seedings cut-off. Elsewhere, the tournament also saw a dramatic match between world number one Neil Robertson and two-time China Open champion Peter Ebdon at the last 16 stage, Ebdon taking the decider on the colours to cause an early shock, before he lost out to Ding in the next round. There were also of course early exits for John Higgins, Mark Williams and Ronnie O’Sullivan, the latter surrendering a 4-1 lead against Liang Wenbo at the last 32 stage, while defending champion Judd Trump exited to Alan McManus as early as Monday. The most impressive wildcard performance of the week came from Zhao Xintong, who defeated Steve Davis, Craig Steadman and Barry Hawkins to reach the last 16, before losing out to Marco Fu. All in all then, another successful staging of what has quickly become China’s biggest ranking event and indeed one of the most important tournaments on the calendar full stop. The event also marks the next seedings cut-off (more in a separate post), before the circuit moves on to Gloucester next weekend. I am pleased to say that I will be there, to bring you all the latest from the sixth event of this season’s European Tour.